Some experts applauded the Mammut Magic Guide High GTX for its excellent waterproofing. 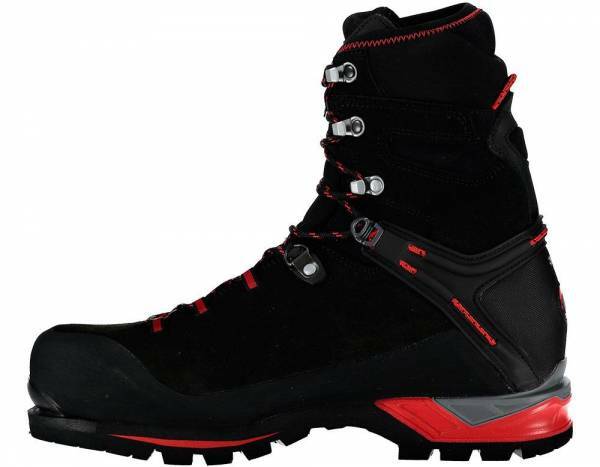 This mountaineering footgear impressed a couple of professional reviewers with its remarkable lightness. Less than a handful of wearers swore by the Magic Guide High GTX’s satisfying level of comfort. A gear critic was stumped about the boot’s supportive heel zone. One blogging website gave this Mammut footwear a thumbs-up for its outstanding walking performance. An experienced adventurer was surprised with the lightness of the Magic Guide High GTX considering it was teeming with features. Amazingly, this mountaineering boot did not have any pressure points which prevented blisters, based on some outdoor gear blogs. A small group of reviewers were astonished that the Magic Guide High GTX from Mammut did not require breaking in at all. The boot’s width was a bit too narrow for a couple of testers. An avid mountaineer was not so pleased with the steep price tag of the Magic Guide High GTX. A few alpinists had reservations with the exposed sliding heel strap cords noting that it is susceptible to damage. Wearing the Mammut Magic Guide High GTX means being given the ability to climb peaks in great comfort. It also means being in a lightweight mountaineering gear that is unbelievably waterproof and does not require a break-in period. With all that said, its reported narrowness and premium price might be a serious cause for concern for some. In the end, the Magic Guide High GTX has enough going for it to be deemed worthy of one’s gear collection. Those with wide feet, however, should look for something else if wearing thinner socks is not an option. More than worth the investment. The Mammut Magic Guide High GTX is an above-the-ankle mountaineering boot that is designed for technical climbs. It has thermal insulation thanks primarily to Gore-Tex’s Duratherm Comfort Footwear membrane. Shielding the wearer’s feet from the elements is the boot’s full-grain leather upper. It is engineered with a Memo Foam to provide cushioning around the instep, shin, and ankle zones. A lining and padding system called Feet Map is part of the boot’s engineering. This system makes the footwear amply breathable and warm. It also prevents pressure points. Its outsole is called the Vibram Maton. This grippy layer is resolable, which means it can be replaced with a new one when certain criteria are met. Mammut’s Magic Guide High GTX is a fairly true-to-size, high-cut footgear built specifically for male mountaineers with standard width feet. It is offered in full and half sizes. Its 3 Zone Lacing system offers fit personalization. Based on the XS Trek compound, which is characterized by durability, responsiveness, and comfort, the Vibram Maton outsole gets to produce ample traction yet remain tough on considerably craggy mountain ranges. Its heavy-duty lugs are specially engineered for tackling ascents and descents. Giving users footing stability and underfoot protection is the Mammut Magic Guide High GTX’s lightweight wedge which is made using a combination of PU, TPU, and poro. It has a B3 level of rigidity and comes equipped with heel and toe notches, making the boot completely compatible with automatic (step-in) crampons. Contributing to the amount of comfort this component provides is the boot’s thermally charged insole. It is made of a carbon-based material. The boot has a Perwanger full-grain leather upper. This protective shell is engineered with an abrasion-resistant rubber rand covering the base of the upper, the elastic Gore-Tex tongue and the Base Fit 2.1 mechanism which grants not only blister protection but also extra heel support. For the footwear’s insulation, Mammut engineers imbued its interior with the Duratherm Comfort Footwear membrane from Gore-Tex. They also gave the boot a half-gaiter made of neoprene for extra warmth. The boot’s closure hardware is called the 3 Zone Lacing system. It consists of round synthetic laces and a set of loops and open hooks. The tongue also has a stud that securely fastens both the tongue and laces in place.